How to distribute documents in Writer? 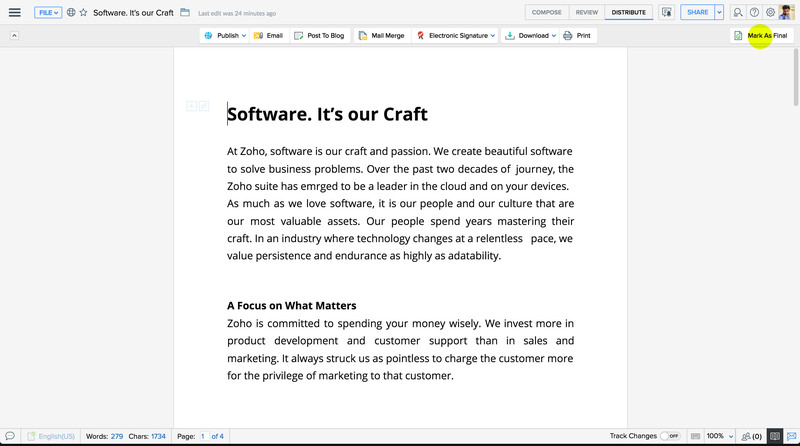 You can easily mail your document directly from Writer without opening your mail box. Click the Distribute button at the top-right corner of the screen and click the Email icon in the top menu bar. Alternatively, Go to File > Share > Email as Attachment to email the document. 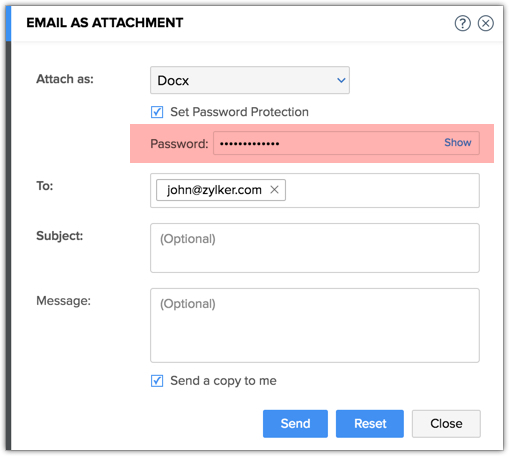 Enter the email address, subject line, set password and the message for the recipient in the Email as Attachment dialog box. Click Distribute > Email icon or go to File > Share > Email as Attachment to email the document. You can mark a document as final when you're done with all the edits. This option helps prevent changes to documents you share with others by making it read-only. Click on the Distribute button on the top-right corner of the screen. A new tab would drop down with Mark As Final at its right most corner. Click on it to mark your document as final. Once you marked your document as final, you can no longer make edits until you enable editing. Click Enable editing, so that you can edit it again, if required. Note: If you have unresolved edits, you will receive a pop-up prompting you to address them before marking the document final.